Throughout the last decade, oral health has become an important topic of discussion in the health care community. Many studies now link oral health to overall health. A person’s mouth is teeming with bacteria, but most of them are harmless. Normally, the body’s natural defenses and good oral health care, such as daily brushing and flossing, can keep bacteria under control. However, without proper oral hygiene, bacteria can reach levels that might lead to oral infections, such as tooth decay and gum disease. Cavities are the result of a bacterial infection, and young children can “catch” the harmful bacteria that cause cavities. It’s important to try to keep these harmful bacteria from our children’s mouths during their first year or two. If left unchecked, they become the dominant bacteria, and the child with them could experience a lifetime of tooth decay. Tooth decay is the most common chronic disease of childhood. It is five times more common than asthma. Untreated, tooth decay can have serious, negative effects on a child’s physical, social, and educational development. Mouth pain makes it difficult to eat a healthy diet, to learn to speak properly, and to concentrate in school. Untreated tooth decay in baby teeth can damage a child’s permanent teeth. The benefits of oral health education and prevention (screening and counseling regarding diet and oral care habits, fluoride varnish application) significantly outweigh the cost of dental disease. For example, full mouth restoration in a hospital operating room costs $6,000 to $10,000. Preventative fluoride varnish application costs 75 cents, takes less than three minutes, and can be done during routine visits to the dentist’s office. It’s okay to share utensils and cups with your children while eating. Almost every parent is guilty of it, but parents should always use a separate utensil or cup when eating with their child. Recent studies have shown young children can get cavities from Streptococcus mutans (MS), a bacterium that can pass from person to person through the transfer of saliva. A 2008 study in Pediatric Dentistry pointed to mothers as the primary source of the MS colonization in their children. Blowing on food is the best way to cool down your child’s meal. Well, not if you are worried about their oral health. MS bacteria can easily be transferred to food and then to children’s mouths. Sugar eats tooth enamel, causing cavities. The true culprit is the bacteria in the mouth, which convert sugar into enamel-eroding acid. Tooth enamel does not grow back, and once destroyed, sensitive dentine are exposed to decay. Cutting back on sugary foods provides less fuel for bacteria, and brushing and flossing regularly are vital to keep bacteria and cavity counts low. Losing baby teeth to tooth decay is okay. It is a common myth that losing baby teeth due to tooth decay is insignificant because baby teeth fall out anyway. Tooth decay in baby teeth can actually result in damage to the developing crowns of the permanent teeth growing below them. If baby teeth are lost prematurely, the permanent teeth may erupt mal-positioned and eventually require orthodontics. You don’t need to worry about cavities in baby teeth. As mentioned above, baby teeth hold the space for permanent teeth. If cavities are left untreated in baby teeth, they can develop into serious pain and abscesses. Occasionally the infection can spread to other areas of the body, and in rare occasions, it can even result in death. As parents, we want what is best for our children. 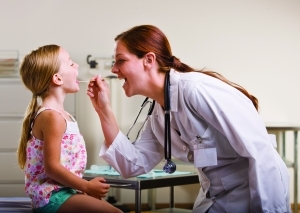 Be sure when you visit your doctor’s office that the health care professionals you see evaluate all areas of your child’s health, including their oral health. These medical professionals can easily be the first to spot early signs of tooth decay and other oral diseases. They can help your dentist nip the problem in the bud before it gets out of hand. And, of course, practice good oral health care with your children, ensuring they brush their teeth twice per day, floss, and limit sugary foods. These simple things can secure them healthy smiles many years down the road. About the author Anita Duhl Glicken, M.S.W.